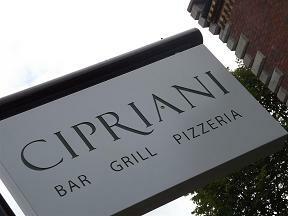 Belfast's latest chic eatery CIPRIANI Bar, Grill & Pizzeria on the Lisburn Road has brought a brand new and most innovative eating and drinking concept to the city. Boasting an Italian Restaurant, Pizzeria, Tapas Bar and Music Lounge all in one, CIPRIANI brings tasty, fresh food to Belfast using traditional Italian ingredients with the very best of local produce. This modern Italian restaurant offering is made all the more contemporary by its luxe surroundings throughout the establishment's three levels. Dine in the restaurant downstairs and make the most of a wonderful, wide array of traditional Italian homemade dishes, paired with a choice wine from CIPRIANI's specially selected wine list, and views over the pizza bar for chef watching. Alternatively, head upstairs to the Tapas Bar and decadent Music Lounge to sip on a cocktail or three and chat over a medley of 'Spuntini', the delicious Italian twist on tapas which are available every day in the bar until late. What is more, CIPRIANI brings entertainment to the Music Lounge every weekend, the perfect accompaniment to great friends, delicious food and refreshing drinks. Proud CIPRIANI proprietor Salvo Liberante is no stranger to the Northern Ireland restaurant scene with an impressive portfolio of successful venues to date including the highly popular Speranza, which he sold in 2006 and the former much-loved Caf' Milano. Salvo comments: 'At CIPRIANI we have reflected our passion for Italian culinary fayre in a menu brimming with great quality dishes, expertly executed and perfectly presented in stylish surroundings. We offer honest, home-from-home Italian cuisine at its best and look forward to putting Italy on South Belfast's map. Have you got Google Earth on your computer? If so, then download the Google Earth Map of Cipriani. Is this the wrong position for Cipriani? If you think so, then modify its position. I was really looking forward to trying this new restaurant as my husband and I love Italian food. I saw a groupon deal and thought this would be a perfect way to test out this new eatery. It was for Italian tapas for two with a glass of proscecco for �14. We went last night (sat 6 October) as it was our anniversary on fri. We were extremely disappointed - we were allowed to select 5 tapas items between us and having had tapas before I was expecting mini portions of itailan meals, like meatballs, carbonarra etc. The only option that was in anyway a smaller version of a meal was mini calzone which had very little filling. Each of the tapas items were very greasy. We were still hungry so ordered desert to fill up! The taps came in at arounf �2.50/�3.00 each so really you were just getting a free glass of prosecco - which was the best part about the meal. I would have been happier to use this voucher at lunch time as it would have been more appropriate, however, they do not open at lunch. We were situated beside the door and had to sit with our coats on! There were lots of staff but the service was extremely slow - we waited almost half an hour on desert. I don't think this trial outing to Cipriani would entice me back!